It is extremely important to know which pathogen is causing damping-off problems and which fungicide to properly apply. The key to controlling damping-off is being proactive instead of reactive. Always refer to the fungicide label for crop use, pathogens controlled, and application rates. Damping-off is caused by a number of important vegetable pathogens and is very common during the spring. Damping-off can kill seedlings before they break the soil line (pre-emergent damping-off) or kill seedlings soon after they emerge (post-emergent damping-off). Common pathogens that cause damping-off include Pythium, Phytophthora, Rhizoctonia and Fusarium spp. Control of damping-off depends on a number of factors. First, is recognizing the conditions which may be leading to the problem (i.e., weather/greenhouse growing conditions) and second, identifying the pathogen causing the problem. Although all four pathogens are associated with damping-off, the conditions which favor their development are very different. 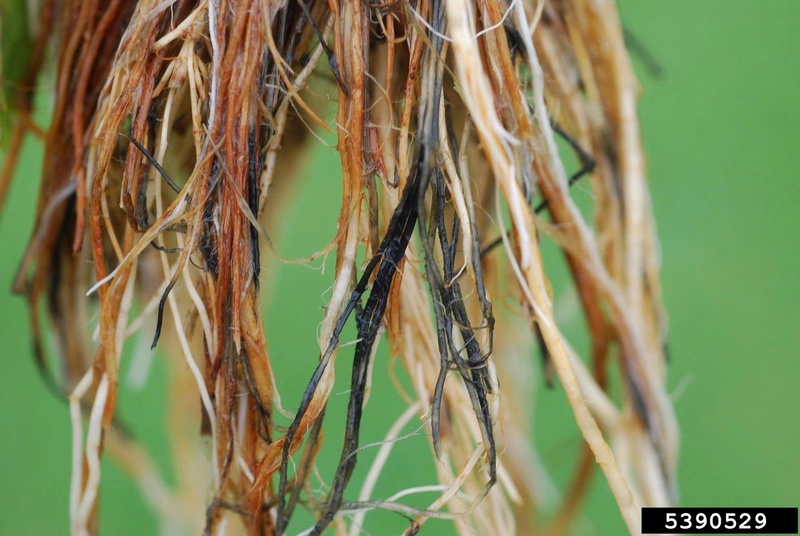 In general, Phytophthora and Pythium are more likely to cause damping-off in cool, wet or overwatered soils that aren’t allowed to dry out due to cloudy weather or cooler temperatures. Conversely, Rhizoctonia and Fusarium are more likely to cause damping-off under warmer, drier conditions especially if plug trays are kept on the dry side to help reduce transplant growth. 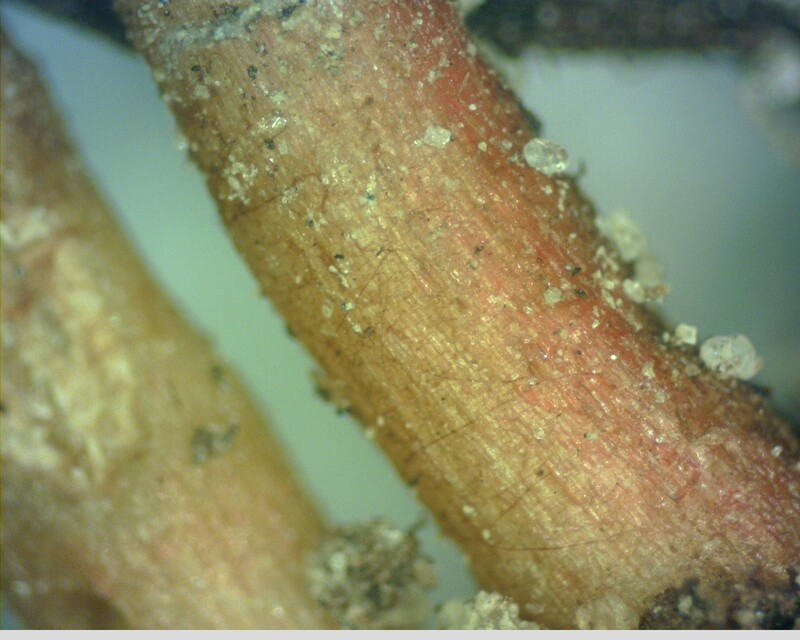 The two root rots causing the most problems in New Jersey during transplant production are Pythium and Rhizoctonia. In general, Pythium tends to kill seedlings before or right after emergence where as Rhizoctonia tends to kill seedlings after emergence. If you are recycling old transplant flats with organic matter left on them from the previous season you may bring pathogens such as Rhizoctonia back into the operation. There are exceptions to the rules, but none the less, all damping-off pathogens can cause serious losses if not controlled properly. In root systems infected by Pythium, the outer cortex of the roots will slough-off if you pull the transplant out of the plug or if you simply pull on the roots with your fingers. If your soil has been excessively wet for extended periods of time because cool, cloudy weather hasn’t allowed plug trays to dry out for extended periods (i.e. days) you may be dealing with a Pythium problem. In root systems infected by Rhizoctonia, the outer cortex of the root system won’t slough off. 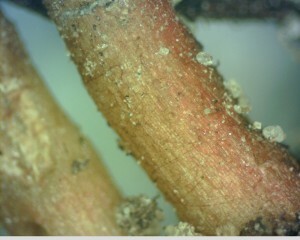 In many cases under ideal conditions, the mycelium of the fungus growing on the surface of infected roots can be seen with a 10x hand lens. Rhizoctonia produces distinct, brown hyphae that always branches at nearly 90 degree angles. 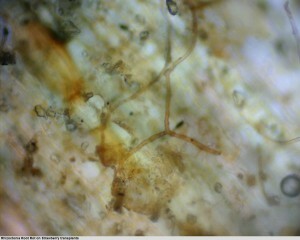 This is a diagnostic feature of the fungus. Unlike with Pythium, the outer cortex of the root won’t slough off. Why is recognizing the different symptoms and diseases so important? The fungicides applied to prevent or control damping-off are specific in the pathogens they control. Fungicides used to control Pythium or Phytophthora won’t control the other damping-off pathogens. Why is this? The biology of the fungus and the mode of action of the fungicide dictates fungicide efficacy. For example, Ridomil Gold and Ultra Flourish (mefenoxam, FRAC code 4), MetaStar (metalaxyl, 4), Previcur Flex (propamocarb, 28), Ranman (cyazofamid, 21), Presidio (fluopicolide, 43), and Phosphites (33) help control the “water molds” (i.e., Pythium and Phytophthora). Terraclor or OLF (PCNB, 14) and azoxystrobin (Quadris, 11) help control damping-off caused by Rhizoctonia root rot. Ranman, Previcur Flex, and phosphites have greenhouse use labels for Pythium control (see labels for specific crops and uses). There are many organic options that can be used to suppress these pathogens in transplant media. These biologicals include Bacillus subtillus (Companion), Streptomyces lydicus (Actinovate), Streptomyces griseoviridis (Mycostop), Trichoderma harzianum (PlantShield, Rootshield), and Trichoderma virens (SoilGard). These products can either be drenched on or incorporated into the media prior to seeding and/or transplanting. These products work by colonizing root surfaces and competing with the pathogen for space and resources. The mechanisms of control by biologicals include some form of antibiosis, parasitism, induction of host defense responses, and/or competition. Disinfectant products such as Zerotol and Oxidate (hydrogen dioxide) may also be used to help suppress fungal pathogens in organic or conventional transplant production. It’s important to understand that disinfectant products also kill biological agents, therefore caution should be used when using these in rotation with organic products. The same holds true for all conventional products. For a list of options for use in greenhouses on specific crops please see Table E-10 on pages 124-126 in 2018 Mid-Atlantic Commercial Vegetable Production Recommendations Guide. See individual crop section for of options in the field. Always refer to the fungicide label for crop use, pathogens controlled, and application rates.